Hope you have a Happy Thanksgiving too. Glad to see some of your plants are still looking great! Happy Thanksgiving! 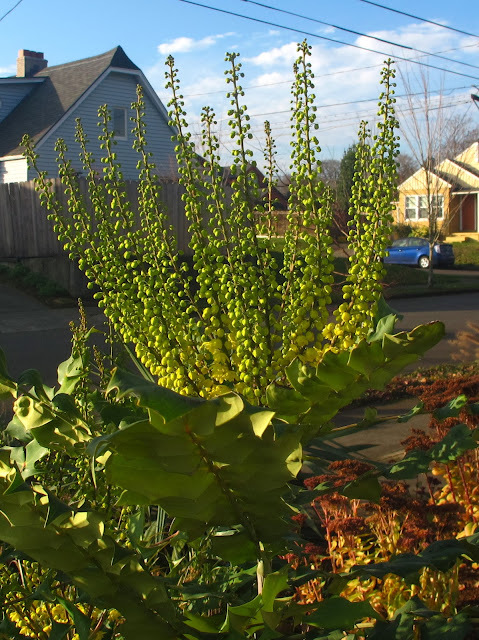 Wow - that Mahonia is amazing! Happy Thanksgiving, Heather! Fortunately tan goes really well with blue so your agaves look especially stunning in front of your cannas and Echium! Hope you had a great Thanksgiving! What great color and activity you have going on in almost-December. Hope you had a happy Thanksgiving! Call me contrarian (it's been done before) but I like the brown almost as much as the pretty blooms. Happy belated Thanksgiving to you, too...gobble, gobble. The clematis looks fantastic climbing up into the bamboo! I'm loving the Fatsia blooms at my house, too. They're the perfect sputnik antidote to gray skies.